U.S. Rep. Ilhan Omar, shown here at a news conference last month, is under scrutiny for comments she made on Twitter on Sunday. President Trump has called on Rep. Ilhan Omar, D-Minn., to resign after she made comments on social media that were criticized as "anti-Semitic" by lawmakers from both parties, including House Speaker Nancy Pelosi. "Anti-Semitism is real and I am grateful for Jewish allies and colleagues who are educating me on the painful history of anti-Semitic tropes," Omar said Monday. "This is why I unequivocally apologize." She also said, "At the same time, I reaffirm the problematic role of lobbyists in our politics, whether it be AIPAC, the NRA or the fossil fuel industry." Trump described the apology as "lame," according to The Associated Press. "Anti-Semitism has no place in the United States Congress," Trump said Tuesday. "I think she should either resign from Congress or she should certainly resign from the Foreign Affairs Committee." Omar, along with freshman Rep. Rashida Tlaib, is one of the first two Muslim women elected to Congress. 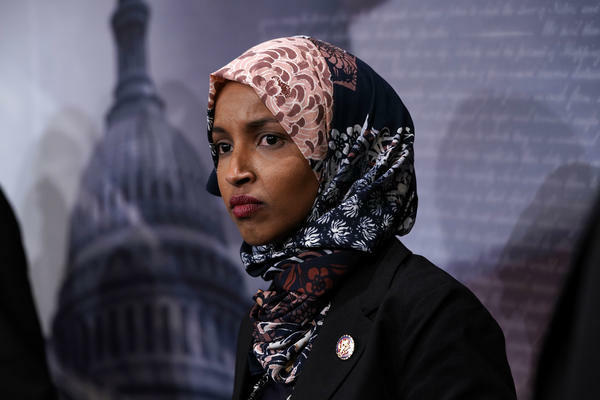 As NPR's Susan Davis reported, "Omar questioned the financial relationship between AIPAC, the powerful pro-Israel lobby, and members of Congress in tweets over the weekend." The initial tweet that sparked the outrage happened Sunday, in Omar's response to a tweet about how she and Tlaib could face action over criticizing Israel. She said "It's all about the Benjamins baby." When asked who she thought was paying lawmakers, she replied: "AIPAC!" Rep. Deb Haaland, D-N.M., one of the first indigenous representatives, told NPR's Here & Now on Tuesday that she is "really happy" that Omar apologized. "Any type of anti-Semitism in any form needs to be soundly rejected," Haaland said. "I thought [House Speaker Nancy] Pelosi did what she needed to do to make sure that we stop this in its tracks, because the Democrats, we support Israel. We support Israel's right to exist." Pelosi and other House Democratic leaders issued a statement describing Omar's tweets as "deeply offensive." Omar is a member of the House Committee on Foreign Affairs. The committee's chairman, Democrat Eliot Engel, said Monday that "it's shocking to hear a Member of Congress invoke the anti-Semitic trope of 'Jewish money.' ... Criticism of American policy toward any country is fair game, but this must be done on policy grounds." Engel stopped short of calling for her to resign from the committee.